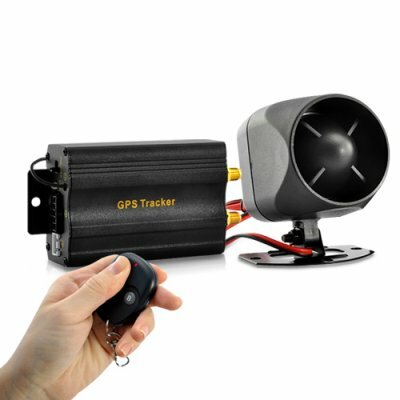 Successfully Added Car GPS Tracker - Car Alarm Function, Real-Time tracking to your Shopping Cart. Introducing Real-Time Car GPS Tracker with Remote Control, Siren and Shock Sensor. This high-tech Car GPS Tracker is the latest technology around and comes with plenty of advanced features that have never been seen before. Want to know why this is one of the best car theft prevention and vehicle protection systems available today? Keep reading! With the convenient SMS text messaging ability, a full range of alarm functions (including gas to engine cut off), and the latest in GPS tracking technology, this GPS Car Tracker is the ultimate safety device for your car, van, truck, or even the entire vehicle fleet. Stop the Engine: You can send an SMS message to the tracker to cut off the gas and battery power, so the engine will remain in an immobilized state until your remove the alarm status. This shock sensor utilizes warning chirps for minor disturbances and will trip the alarm if it detects more serious impacts or disruptions. With the siren, if someone unauthorized opened the door, the siren will start wailing louder than 100 firstborns - at the same time. Think cutting off the car's alarm wire will it off? Hah! This sensor and siren is sure to let would-be thieves know that your vehicle is equipped with an advanced alarm system, so stay away! Add another layer of security with this car GPS tracker's remote control lock/unlocking! Power lock doors can be controlled from several feet away and no one can enter your vehicle without your wireless transmitter. Lose your keys? At least your car will still be safe! This GPS tracker gives you a peace of mind for the perfect price. If purchased separately the contents of this kit would easily approach $300. With this one, you save almost 70% and everything is compatible right out of the box! Available in our warehouse now, order today and we'll express ship it out tomorrow. Brought to you by the leader in wholesale electronics ... Chinavasion. on 2012-06-07 04:31:09 very good product ! easy instalation for my fiat bravo2 ! on 2012-05-18 03:34:54 I recommend the purchase. Very fast delivery to Brazil. 15/04/2012 day I bought and received on 17/05/2012. I also enjoyed the package. Well protected. I recommend the purchase.